Clean floors, kitchens, bathrooms and more! Clean and disinfect a variety of surfaces in your home using only water - no toxic chemicals. Canister Steam Cleaners are perfect for the above mentioned surfaces - plus you can clean kitchen areas such as stoves, ovens, countertops, sinks; bathroom areas like tile, bathtubs, showers, sinks and toilets. Also, you can clean grills, automobiles and disinfect mattresses, pet bedding and carpets. 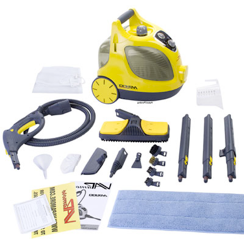 Hand-held Steam Cleaners are ideal for quick cleanups in kitchens, bathrooms, autos and more. Steam Cleaners, Steam Vapor Cleaners, Upright Steam Cleaners, Canister Steam Cleaners, Hand-Held Steam Cleaners. Thanks for visiting Capital Vacuum Raleigh and Cary. 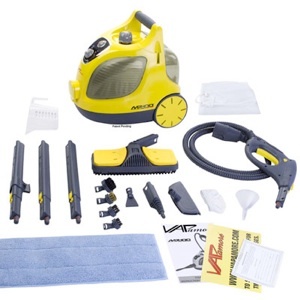 Steam Cleaner Sales, Service, Repair & Supplies. Clean with powerful disinfecting steam! The Best Quality Cleaners In The Triangle...and beyond!